A low budget Korean documentary about a deep bond between an old farmer and his 40-year-old ox is bringing tens of thousands of Koreans to tears. "Old Partner" (Wyo-nang so-ri) has so far drawn over 265,000 theater goers by last Saturday, just three weeks after its opening on Jan. 15, breaking all former box office records held for any art house film ever released in Korea. The former record is held by "Once," which sold about 220,000 tickets domestically. For a low budget indie documentary with limited release, the current sales record is already phenomenal, but some industry watchers in Seoul are predicting that even 1 million mark would not be unthinkable given its wide appeal across different age groups. 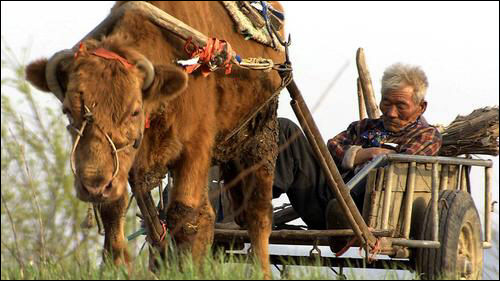 "Old Partner" is 78 minutes long poetic documentary about an uncommon relationship between Choi, a feeble old farmer and his 40-year-old work ox. Average life span of ox is usually 15 years but his 'old partner' has managed to work for his master over 30 years thanks to Choi's almost religious adherence to organic feeds and deep care. The ox dies eventually after 30 years of loyal and relentless service to his master, leaving behind him mountains of wood stacks to keep his master's family warm over the harsh winter. Director Lee Chung-ryoul was looking for a subject that would show his personal thanks to his father generation in the wake of Asian financial crisis, when he finally settled down on Choi and his 40-year-old ox. He followed them for three years, filming them using over 300 digital tapes. But KBS -- Korea's public broadcaster -- and his most promising client declined to air it after judging it to be an "unattractive subject." Lee was about to give up the project when he decided to re-edit the tapes for the theater release. "Old Partner" was one of the most acclaimed movies in Pusan and was invited to the Sundance Film Festivals this January. Its screening there reportedly drew rave reviews among the Sundance audience. Now that he's finally recovered his long overdue investment, Lee's only concern now is that the sudden fame that entailed the movie's success is drawing unwelcome attention to Choi's family in Bonghwa. In the director's blog he begged the movie's fans to restrain their curiosity and leave them alone.